Living life without the constrains of debt for some seem like an impossible dream, they live paycheck to paycheck and they find that borrowing money with high interest rates is the only way to manage the financial burden that they feel. However, life doesn’t have to look like this, you can live debt free, often without a mortgage too, but in reality a lot of people still have this debt and there is nothing wrong with debt, but you need to handle it correctly. If you want to become debt free, it is possible, it does take work and commitment but it is not an impossible task. The most important step is that first step to living a life without debt; you have to admit how much money that you owe. You need to work out who you owe money to, the amount that you owe, the interest rate you’re charged and the minimum amount that you must pay each month; without this information you haven’t the tools in place to tackle the debt. Create a budget, you need to know the amount of money that you have coming in each month. You can then look at your finances and work out how you are going to live and pay off any debt that you owe, without taking out more credit. You need to have money spare once you have paid all your bills, so you can use this extra towards the debt you already have. If you don’t have spare money you might need to adjust the amount of money which you use for groceries or luxuries, so that you can enable overpayments. Working out the debts that you need to pay extra to each month, to pay off the debt quicker is easy; look for the lowest amount owed, and see if you can over pay each month. 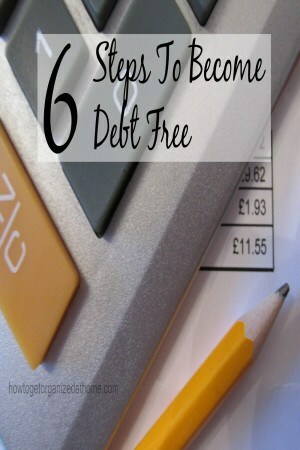 This will pay off the debt quicker and it means that you will pay less in interest. When this first debt gets paid off, use the money that you were paying towards this debt and apply it to the second lowest debt you owe. You will be paying the minimum amount plus the amount you were paying towards your first debt, making the second debt reduce more quickly and paying it off, saving interest payments. Continue this method of debt payment until you have paid off all debts. Avoid future debt until you are in a more financially stable position. It is important that you consider saving for those annual bills or for those emergencies that you can never plan for, this can avoid the need for taking out further debt, often at very high interest rates. If you are struggling to take control of your debt, then it is important that you seek help; there are charities that will help you find ways to pay off your debt and move forward with your financial understanding. It is important that if you are struggling, you look for ways in which you can increase your income; this will reduce the burden and hopefully pay off your debts quicker. Therefore, if you are looking to become debt free it is possible, it will take hard work and commitment to succeed, but in the long-term, it is worth the difficult times ahead until you have paid off all your debt. It is about learning to live within your budget and not to rely on the credit companies who do charge high amounts of interest, to meet the needs of a population that is highly motivated to live life in debt. If you are looking for more articles on this topic head over to the landing page where you will find links to other posts on debt. I think setting a budget and then sticking to the budget is a big thing. We all know how much we have to spend on bills etc. each month, but it is the extras that seem to pop up that haven’t been budgeted for that get us. Great tips!